The employees of the Philadelphia Regional Port Authority had the opportunity to say hello to an old friend this week, as former Director of Governmental & Public Affairs William B. McLaughlin, III emerged from retirement to visit the Port’s headquarters for a very special occasion: the dedication of an executive conference room in his honor. “The McLaughlin Room”, as it came to be known in the months prior to its official dedication on Tuesday, July 8, is located near the offices of the Executive Director and Senior Deputy Executive Director, and is frequently used by those individuals, as well as other port staff, for meetings and conference calls. 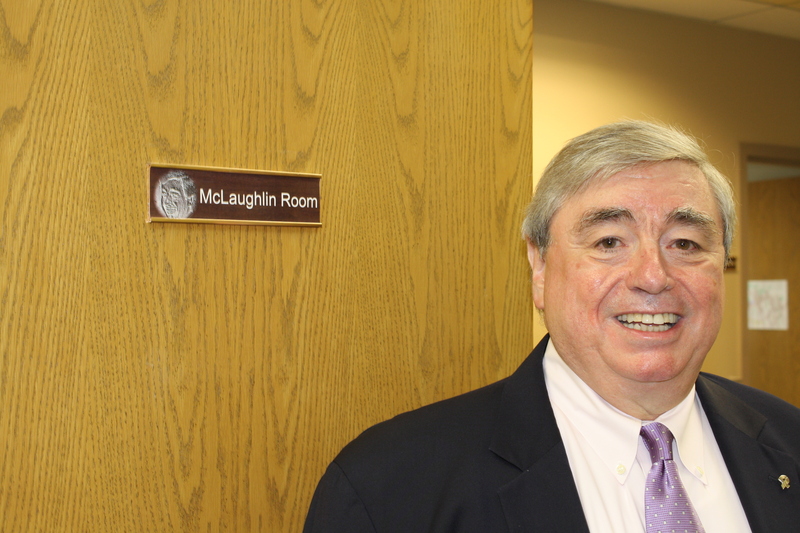 Though Bill McLaughlin has kept in contact with his former colleagues since retiring, he had previously shied away from the limelight and declined any official recognition of his years of service, so it was a happy surprise when Bill agreed to take part in the dedication of his conference room on July 8. The 4:00 p.m. ceremony was presided over by PRPA Executive Director James T. McDermott, Jr., and witnessed by about twenty-five members of PRPA’s administrative staff. PRPA Board Member and ILA 1291 President Boise Butler also attended, as did Bill’s wife, Katherine Sokoloff. After cutting a ribbon stretching across the conference room’s doorway, Bill entered the room and was immediately delighted by the many framed photographs of him hang on its walls, each depicting Bill during the course of his duties: greeting dignitaries, presiding over meetings, and traveling to points around the world representing the Port he served so well. Shortly afterward, many of Bill’s friends and former colleagues continued the celebration at a local restaurant. William B. McLaughlin, III was born in Philadelphia on November 17, 1945, and grew up in neighboring Delaware County. He graduated Monsignor Bonner High School in Drexel Hill, Pennsylvania and received a Bachelor of Arts degree from St. Bernard College in Alabama in 1968. He taught in the public school systems of Camden, New Jersey and West Chester, Pennsylvania. In 1971, he was appointed Special Assistant to Pennsylvania Governor Milton J. Shapp and in 1974 was named to the position of Legislative Secretary to the Governor, the youngest person to ever hold that position. In 1978, he was appointed Senior Budget Analyst for the State Senate Appropriations Committee. In 1981, he was named Deputy City Representative in the Administration of Philadelphia Mayor William J. Green, in which capacity he represented the City at various public and civic events. In 1986, he was appointed Director of Corporate Communications for the Philadelphia Port Corporation and in 1989, upon the Port Corporation becoming the state-sponsored Philadelphia Regional Port Authority, he became Director of Communications, Governmental and Public Affairs for that agency. With a departmental re-organization in 2000, Mr. McLaughlin was totally focused on his career specialties as the agency’s Director of Governmental and Public Affairs. Mr. McLaughlin is married to Katharine Sokoloff and lives in Philadelphia. A lifelong music enthusiast, Mr. McLaughlin served on the Board of Directors of The Philadelphia Singers for over 25 years. Currently, he is a Trustee of The Presser Foundation and is the former President and current Board Member of the Musical Fund Society, an endowed organization which provides grants to Philadelphia-area musicians and arts organizations. The Philadelphia Regional Port Authority is an independent agency of the Commonwealth of Pennsylvania charged with the management, maintenance, marketing, and promotion of publicly owned port facilities along the Delaware River in Philadelphia, as well as strategic planning in the port district. PRPA works with its terminal operators to modernize, expand, and improve its facilities, and to market those facilities to prospective port users. Port cargoes and the activities they generate are responsible for thousands of direct and indirect jobs in the Philadelphia area and throughout Pennsylvania, as well as numerous other economic benefits.